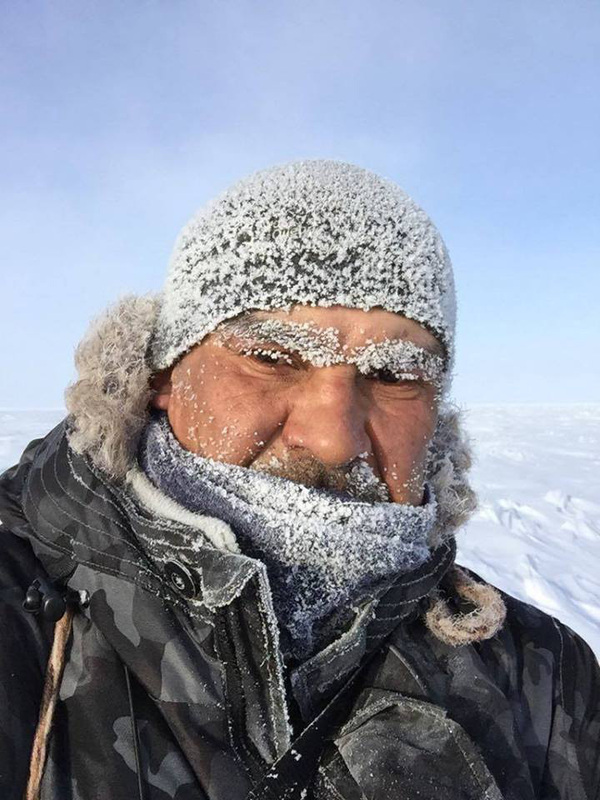 A Cree man’s life-changing journey through Inuit territory. John Clarence Kawapit was ready to turn back when the wolves came. He had been walking north along the tundra, the bitter -20 °C cold cutting through his clothes. He was running out of food. Around him, there was nothing but snow and ice. He had passed a few hunting cabins and had borrowed a blanket from one, but it did nothing to warm him. He paused and looked back in the direction he’d been walking. There, as if in answer to his question, was a wolf heading northward. Kawapit began to follow it, frightened at first. Soon, four more wolves joined in. By the time they disappeared, Kawapit was committed. His goal: to follow Quebec’s northern coastline in a 2,300-kilometer arc, passing through 14 Inuit communities along the way. It would be unfamiliar and potentially dangerous territory for Kawapit, who is Cree, because in his hometown of Whapmagoostui, in northern Quebec, the Cree and Inuit do not get along. But he’d been told to head north in a powerful dream, one he didn’t dare defy. Kawapit, a 46-year-old artist, calls it his healing journey. It isn’t his first one: in 2013, Kawapit supported a small group of Cree youth who traveled south from Whapmagoostui to Ottawa as part of Idle No More, a movement demanding a stronger voice for First Nations, Inuit, and Métis in Canada. 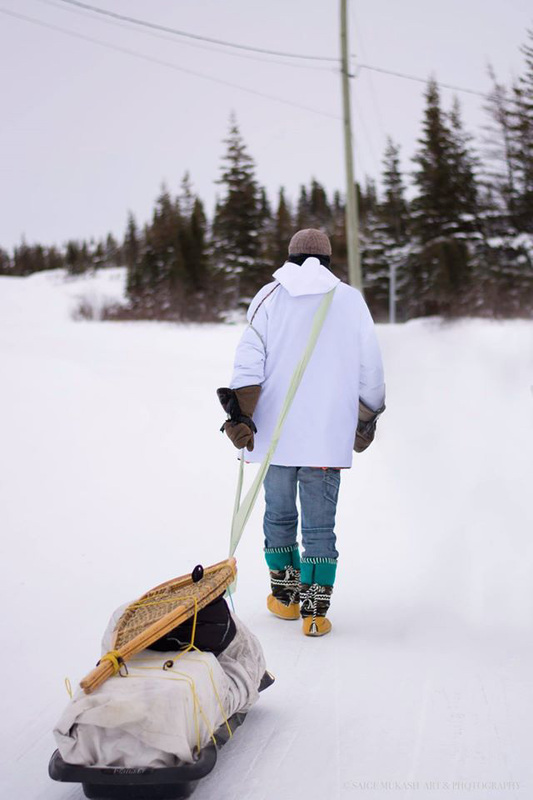 He made the journey only partway, helping break trail by snowmobile, yet he observed how the walk affected the activists. In Cree medicine, moving toward change is a crucial stage in healing. The long walk helped the youth connect with nature, get physically fit, and uplift their spirits with the sense that they were taking action. By the time Kawapit set out on his own healing journey on January 30, he needed a radical change. Last December, he tried to take his own life. He was sexually abused as a child and has struggled with alcohol addiction for years. When he told someone about his plan to kill himself, he was urged to go to the hospital to seek help. There, he dreamed that an old man told him to go north. Kawapit had no doubt it was his older brother, Isaac: in Cree tradition, a person’s spirit remains after they die, appearing in visions and dreams to come to people’s aid during troubled times. Isaac led the young Cree walkers on their journey to Ottawa, but three months after the journey ended, Isaac died of substance abuse. Like Kawapit, he’d struggled with addiction for much of his life. That was why, Kawapit realized, Isaac was advising him to take a different direction on his own journey and head north. “When I got back home, I thought about it, I started to talk about it, I started to say, ‘I’m gonna do this,’” says Kawapit. “But at the same time as I talked about it, I got more stressed out.” The thought of leaving his hometown and heading to foreign communities drove him to drink even more than before. When he woke up at 5:00 a.m. on January 30, following another night of excess, he realized he couldn’t put it off any longer. Simply talking about leaving, or taking time to plan a trip, would only give him an excuse to delay and keep drinking. Instead, he took a few hours to gather some clothes and food on a sled, then left town, heading northeast on foot. He had no plan; all he had was his brother’s advice. Due north was Hudson Bay; to stay on land, Kawapit would have to follow the coast. This would generally make it easier to navigate, but sometimes he could hardly tell the difference between land and ice. The first few days, he struggled, the physical toll quickly wearing him out. He began to shout, releasing the pain he’d been bottling up for years. He was not alone for long. Alice Mary Narlik, his common-law wife, joined him in Inukjuak, the second community he passed through, and his son Anthony joined him at the next stop, Puvirnituq. Others joined the walk for short stretches. Volunteers followed along on snowmobiles, zipping to and from the nearest town to restock their supplies. Back in Whapmagoostui, family members updated a Facebook page called John’s Healing Journey, which has garnered more than 4,000 likes. As they trudged into each community, Kawapit and his companions were greeted with feasts. Some people donated caribou meat to the walkers; others gave them free bingo tickets so they could join in the local entertainment. Businesses and organizations donated thousands of dollars’ worth of clothing and food. Kawapit’s newfound friendships with the Inuit helped heal wounds that run deeper than his own troubles. For centuries before the Europeans arrived, Inuit and Cree fought bitter battles when their hunting grounds overlapped. The tension between them lingers today, particularly in Kawapit’s hometown. Whapmagoostui and neighboring Kuujjuarapik are essentially the same town situated on the Great Whale River in northern Quebec; one side is Cree and the other is Inuit. Each community has its own schools, events, and type of housing. There’s very little social mingling or intermarriage. “It’s not right to live as though we’re ignoring each other,” says Kawapit. Some of Kawapit’s new Inuit friends offered to take him kayaking in the summer, while others led him to a popular ice fishing spot. Those who tried to coax Kawapit into drinking with them were turned down. Instead, he gave talks at churches and schools, telling people about his difficult past and his healing journey. A deeply spiritual man, he always thanked his Creator for allowing him to make the journey and guiding him down the right path. Despite his initial struggles, after weeks of walking, Kawapit began feeling younger and healthier. His knees ached, but otherwise, he liked the changes he saw. “No more beer belly,” he said proudly, two months into the journey. But by late March, after 800 kilometers, Kawapit’s knees hurt too much to go on and he decided to put his walk on hold. It wouldn’t be long before the ice would start breaking up, which would make his journey far too dangerous. He’ll have to wait until next winter to continue. On April 7, Kawapit flew home from Ivujivik, the fifth community on his route. After a warm welcome and some rest, he and Narlik flew north to Sanikiluaq, Nunavut, to visit with Narlik’s family for a few weeks. But Kawapit plans to return to Whapmagoostui soon for knee surgery. It’s time to get in shape for next year’s journey; walking is one habit he wants to hold on to. Correction: A previous version of this article notes that Alice Mary Narlik joined her husband in Puvirnituq. Alice joined John in Inukjuak, while John’s son, Anthony, joined him in Puvirnituq. Samia Madwar is a freelance writer and editor based in Vancouver. She has worked as an editor at Up Here, a magazine covering Canada’s Far North, and as new media editor at Canadian Geographic. Her articles have also appeared in Arctic Deeply, CBC Arts, and CBC Music. 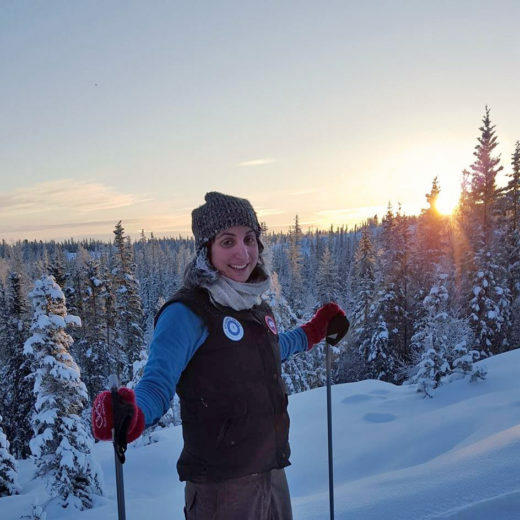 Cite this Article: Samia Madwar “A Healing Walk on Arctic Ice,” Hakai Magazine, Jun 6, 2016, accessed April 25th, 2019, https://www.hakaimagazine.com/features/healing-walk-arctic-ice/.